But after 18 months of court battles they are confidently instructing the law students to appeal against the court-imposed settlement. This law clinic is one of a new wave of workers' advice services springing up across China, thanks to a mix of home-grown philanthropy and foreign pressure. China's government is also pushing for changes, anxious to defuse the potentially explosive mix of mass migration - 100 million people have left rural areas - and mass layoffs as China modernises its economy. 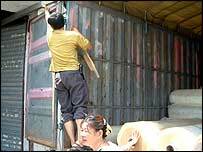 Workers who strike or demonstrate risk jail, but that has not stopped Chinese workers from staging protests. Unpaid construction workers barricaded themselves into building sites and sat on cranes ahead of the last Spring Festival. A laid-off worker set himself alight in Tiananmen Square on National Day. Guangdong province churns out one third of China's exports, and contributes 10% of its fast-growing economy. Jobseekers flock there from all over China hoping to get rich. Half the 40 million people in Guangdong are from elsewhere. They face low pay, long hours, forced overtime, hazardous machinery, noxious chemicals, and cramped and crowded dormitories. "Most cases are about workers not being paid in time and about injuries, for instance workers losing their fingers in the machine," says Professor Cai Yanmin, Vice-Dean of Sun Yat-sen University Law School. 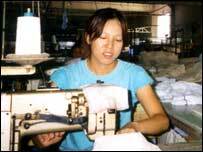 Communist China has plenty of detailed laws on workers rights, but they are often ignored. "Sometimes legislation is one thing and enforcement is another," says law student Wang Yu. "The law has been there all the time, but most migrants didn't know about it, or....they didn't know how to use it to protect themselves," says Prof Cai, whose students teach classes to workers. Now the state is looking to improve workers' access to legal help. It has opened nearly 2,500 official legal aid centres since the mid-1990s. It is also rethinking many of the rules that discriminate against migrants; this year it rewrote the law to guarantee they could qualify for legal aid. These policy shifts are nudging once-risky human rights activities into the mainstream. In August, crusading Guangzhou labour lawyer Zhou Litai organised China's first national conference on industrial compensation. The European Union footed the bill and about 60 people pitched up. 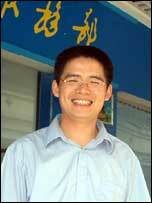 Zeng Feiyang is another long-standing campaigner, though only 29 years old. Five years ago, he ditched his government job to found the Migrant Workers Documentation Centre (MWDC) on the outskirts of Guangzhou. He ranks overtime as the worst problem, followed by injuries. He thinks the law is often detailed and clear, but courts fail to take account of the realities of shoddy documents - or none. Mr Li would agree. It took months to extract legally adequate proof of past wages after his firm slashed pay to 395 yuan ($48; £29) a month from 1,881 yuan. Meanwhile the court set compensation levels using the firm's scanty information. "Is the law fair? I don't know. We took our evidence to court, the employer did the same, then the court took the employer's evidence," he says. Workers can lose cases because they lack information about chemicals they work with. One client went blind after two years in a rubber factory, but could not prove the cause, says Mr Zeng. "There are lots of cases like this...We don't know enough about these products." 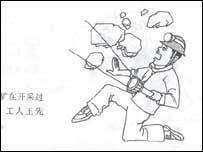 Injuries are compensated according to a fixed scale - a missing finger, for instance, would probably mean 50,000 yuan in compensation. "There are so many factories here... Actually inspections only take place when accidents happen," says Mr Zeng. After a tragedy, the authorities "really crack down, and that cannot be solved by money." Although bribery does take place, the bigger problem is a lack of respect for workers' rights among officials. Multinational firms, fearful of a consumer backlash, tend to have higher standards, say Chinese labour lawyers. Sports shoe brands Nike, Reebok and Adidas published independent inspectors' reports for the first time this year. Taiwanese and Hong Kong investors are the worst offenders, says Mr Zeng. But times are changing. Workers' compensation cases have nearly doubled in the last five years, to 184,000 in 2002, Labour Ministry figures show. Workers won 47% of their cases in 2002, while companies won 15%, and the rest were settled in arbitration. "The bosses wouldn't speak to us, they just told us to go to court," says Mr Li, smiling. The mechanics have won their case, and now they are going back to court for higher compensation.